Libraries today offer much more than just books and information. They’ve become hubs where patrons can access resources like laptops, e-books and hotspot devices. One night a few years ago, Tony Marx was closing up a Bronx library when he noticed a kid sitting on the steps. The boy was pecking away on the oldest laptop Marx had ever seen. Puzzled, Marx asked him what he was doing. The boy told Marx he was doing his math homework. The assignment was online and the boy’s family couldn’t afford broadband at home. So the youngster camped out on the library stoop to pick up its leaked signal. Since then, the NYPL has rolled out a host of services aimed at closing the digital divide, which is exactly what it sounds like: the gap between those who can easily get online and those who can’t. The famous library — who hasn’t seen Patience and Fortitude, the marble lions who guard its main entrance, in the movies? — provides computers and laptops at its locations, and lends out mobile hotspots for months at a time. And like at Starbucks, the Wi-Fi is free. The NYPL is far from the only library rethinking its role in the digital age. Around the globe, libraries are repositioning themselves to meet the needs of a world where almost everything on the shelves can be found online. Many see themselves as centers of digital culture offering classes in the latest tech, such as 3D printing and digital video editing. Key to that mission is helping patrons who can’t afford internet service, like Marx’s young friend, find a way to get online. As of Sunday, libraries across the US began celebrating their evolving mission as part of National Library Week. Melinda Gates serves as the honorary chairwoman of the annual event, which American Library Association started in 1958. Gates is a good choice. She and husband Bill began funding computers, internet access and software for libraries in low-income communities through a foundation they established in 1997. The foundation wound down in 2018, but gave away more than $1 billion worldwideduring its run. Providing internet connections is increasingly important for libraries as more aspects of our lives move online. Forty-seven percent of US households earning less than $30,000 don’t have broadband, according to Pew, and 44 percent don’t have a desktop or laptop. At the NYPL, three quarters of the people who check out the hotspots live in households earning less than $25,000 a year, Marx says. If you want an example of how bad the digital divide is, look no further than San Francisco, the world’s tech hub. More than 10 percent of the city’s nearly 900,000 residents don’t have internet at home, according to the San Francisco Public Library. City Librarian Michael Lambert says the library is the largest free provider of high-speed internet to the community, having facilitated over a million internet sessions a year. 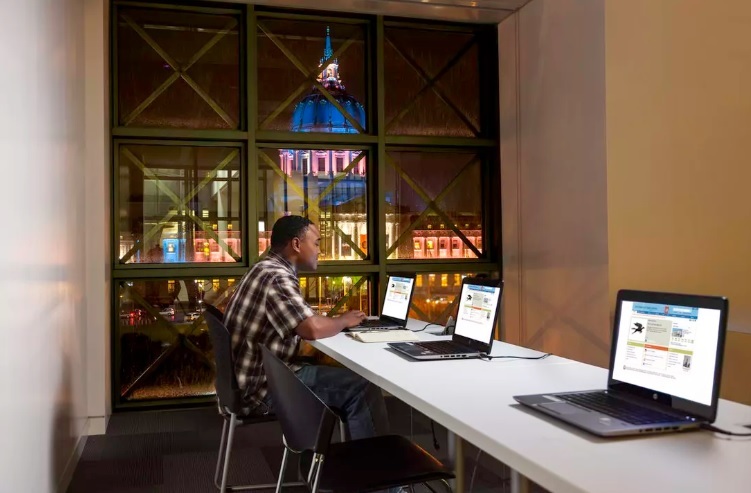 The SFPL also lends around 200 mobile hotspot devices that patrons can keep for three weeks at a time. The main library, walking distance from city hall, offers programs on everything from computer basics to coding. In early May, it holds Connect With Tech Week, an initiative to promote internet access and build tech skills. An annual Senior Tech Expo is designed to help older patrons with basics, such as downloading e-books and browsing the internet. Thirty-two-year-old Victor Franco has been accessing Treehouse, an online platform that teaches coding, using his SFPL account. He finished the Python basics course and is now in a machine learning track. “I was looking into enrolling in coding boot camps, so I decided to take a look at the e-learning courses offered through the library,” Franco said. Lambert says the percentage of physical checkouts at the SFPL has plateaued, and more people are taking advantage of the library’s digital collections through applications like Libby, Hoopla and RB Digital. Those digital checkouts make up about a quarter of the library’s circulation activity, which was more than 11 million in 2018, Lambert says. That digital shift has freed up library staff to plan more events and programs, he adds, because they don’t have to spend as much time putting books on shelves. They’re also available to answer people’s questions via online chat services. It isn’t just long-established libraries that are adapting to the environment. Three years ago, a nonprofit called Heritage Services teamed up with community leaders in Omaha, Nebraska, to create Do Space, a “technology library” that aims to provide access to software, computing and emerging tech like 3D printers. Sessions such as Cyber Seniors teach older patrons how to use their phones, while Tech Help Tuesdaysoffers drop-in advice for people with questions about their phone, tablet or computer. Do Space also has a range of equipment, such as a 3D scanner, that visitors can use. The scanner has come in handy for 26-year-old William Verrillo, a dental student at Creighton University who uses the tech to create digital orthodontics for class. Another youth-oriented space, TeenHQ at the San Jose Public Library in California, features a gamer lounge and drop-in makerspace training for patrons who want to learn how to use a 3D printer. It also offers time on a sewing machine. Libraries aren’t simply waiting for patrons to come to them. The Parkman Branch of the Detroit Public Library takes the internet to its patrons. Two years ago, the Parkman Branch partnered with Libraries Without Borders to create pop-up libraries in laundromats around Detroit. Dubbed the Wash and Learn Initiative, librarians hit three locations to set up laptops and Wi-Fi hotspots. They also had some books on hand for kids and teenagers. Creating the connected spaces in laundromats made perfect sense to Qumisha Goss, a librarian at the Parkman Branch who was involved in the project. Poorer families — the ones that can’t afford internet access at home — spend a lot of time in laundromats because they don’t have washers or dryers. Since customers often have to wait around for hours for their clothes to be done, the computers gave them a way to be productive during that time. They’ll go to pay their bills, check email or write a resume, Goss says. Though the library also offers Wi-Fi and computers, the laundromat has the additional benefit of being open 24/7. When the library’s closed, Goss says, people head to the laundromat for computer and internet access, even if they aren’t doing laundry. When the program first started, Goss wasn’t sure how popular it was. But she quickly found out when she removed the computers to clean them and perform other maintenance. During their absence, members of the community streamed into the library to ask where they’d gone. “That was the first indication that people had really started to use them regularly,” she said. It’s no surprise the initiative has been so popular. In an internal survey conducted two years ago, patrons cited access to Wi-Fi and computers as the top two reasons they go to the library. The digital shift taking place at libraries across the country has understandably led to some uncertainty and concern about their futures. In a since-deleted Forbes op-ed published last year, one writer suggested that Amazon should just replace libraries to save taxpayers money. It’s no surprise that suggestion didn’t sit well with librarians. As technology continues to develop, libraries will likely do everything they can to keep up or stay ahead of the curve. But in a world where so many interactions happen online, perhaps one of the best assets they can provide is being a physical space for people to convene. Marx, the president and CEO of the NYPL, says he lost track of the young patron who was camped on the library’s steps doing his math homework. Still, the library executive says the experience inspired him to put more emphasis on getting people into his institution and online.